"No more pencils, no more books, no more teacher's dirty looks!" Whatever happened to our teachers and other school staff members? If you have any information on them please let me know. Lives in the Hereford area. He is in good health and enjoying life and retirement. 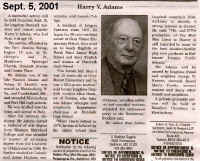 Mr. Adams passed away while receiving dialysis. He was taken to the hospital but he was already gone. There was a memorial service for him at St. Georges and St Matthew's Episcopal Church on Saturday, Sept 15, 2001 at 10 am.